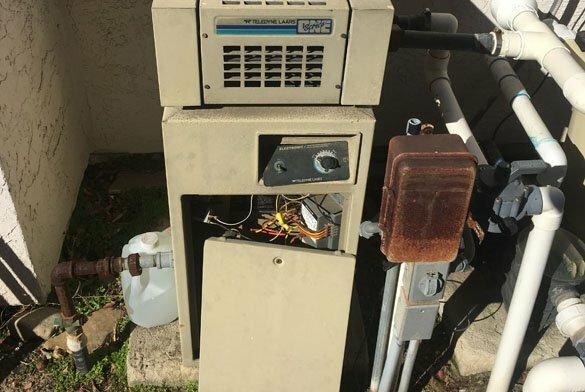 A San Diego homeowner who recently bought a house in Carmel Valley called us regarding their swimming pool heater. The first time they attempted to use the pool heater they discovered the heater would not fire. Our office scheduled a service call to troubleshoot the pool heater. 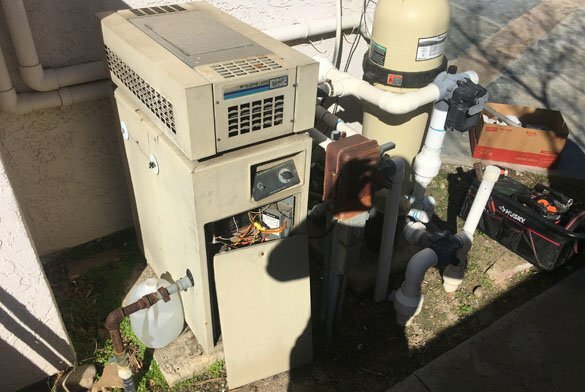 After arriving at the Carmel Valley home we began to diagnose the pool heater. 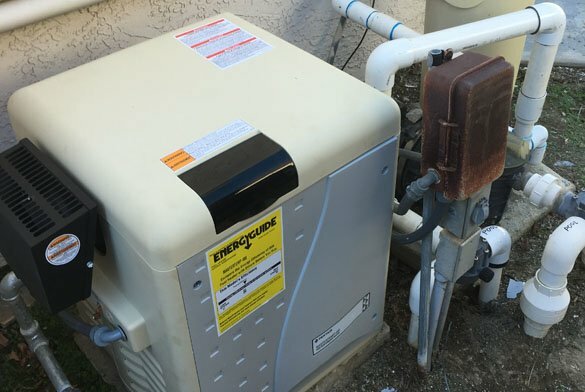 The pool heater is a Teledyne Laars EPC Series One 125. More than one problem was found after looking at the heater. We proposed that the pool heater should be replaced. One reason to install a new heater was the age of the heater. Another reason to replace instead of repair the heater is the efficiency of a new heater.The heater installation began with removing the old heater. We disconnected the electrical wiring and cut the plumbing. The gas line was also disconnected. As with other heater installations, we recycled the old heater. Along with the heater removal we also replumbed the Pentair Clean & Clear RP cartridge pool filter. Attached to the pool equipment was an old pool solar panel. 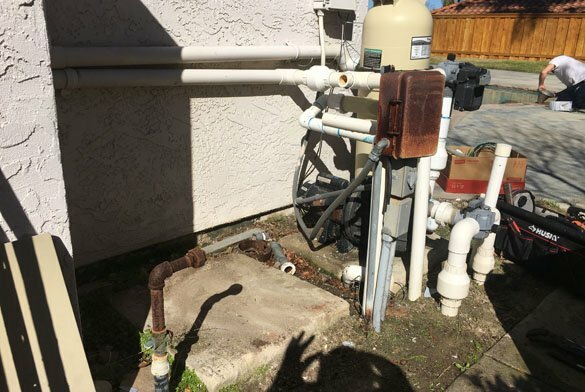 We took the solar out of the plumbing loop. 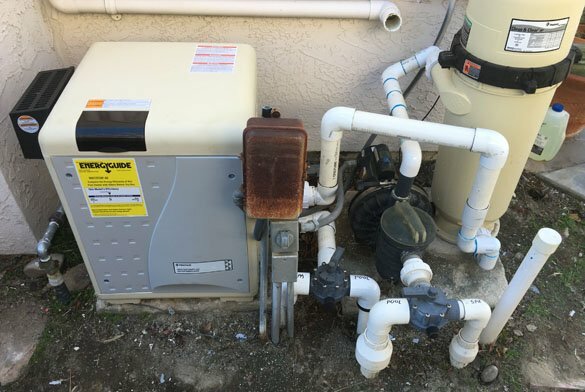 A Pentair MasterTemp 400 pool heater was then installed. The high efficiency swimming pool heater was used because of its small size. There was not a lot of room in the equipment area to place the new heater. Once the new pool heater installation was completed we scheduled a pool orientation. The San Diego pool owners wanted to provide their own pool cleaning. We explained the pool equipment and the pool cleaning process. ProTouch Pool Services offers San Diego County professional pool heater installations. You guys have been fantastic and your continued support of a first time diy pool owner has turned what could have been a stressful undertaking into a manageable and even enjoyable part of home ownership. You continue to support your work and product way beyond the install and you have supported me in the care of my pool way beyond my expectations. Thank you!